The major characteristics of Polyurethanes are their extraordinary physical properties and the variety of strengths that are available between the different families of urethanes. There are two main reasons for using polyurethanes; their physical performance and their cost effectiveness. Dataroll produces a wide range of polyurethane compounds comprising ester, ether, MDI and TDI systems ranging in hardness from 20° A Shore to 80° D shore. Significantly tough, high wear, tear and abrasion resistance polyurethane can significantly outperform rubber in most applications, often at the same or better cost. We provide a complete range of MDI, TDI, polyether and polyester urethane systems. 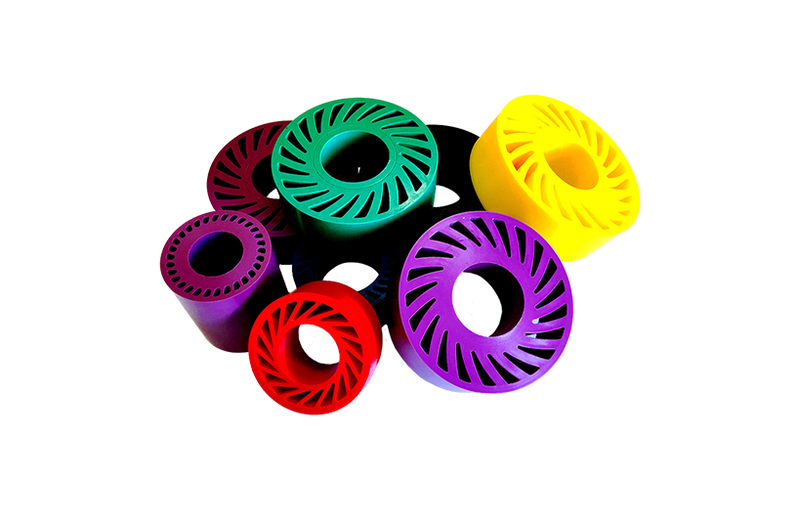 We have developed many techniques to achieve high strength bonding of polyurethane to most materials without affecting the integrity of the parent material, particularly important for bearings. What we off is quality, flexibility, competitiveness and excellent customer service. We specialise in producing cost effective products whether it’s for a one off or for a large production batch of thousands. Excellent in-house facilities for component preparation ensure high strength and integrity bonding of the product to polyurethane. Excellent abrasion resistance compared to rubber, plastics and some metals offering a potential 3-4 times better life expectancy, Excellent compressive strength resulting in higher load capacities than for other elastomers and a high load bearing capacity in shear. Polyurethane also offers superior impact resistance, outperforming most plastics. Good cut and tear resistance properties. It also has wide resistance to most chemicals. Polyurethane can be bonded to a wide variety of substrates e.g. metal, plastic and wood. Care and meticulous preparation ensure superb polyurethane to component bond strength.